Manufacturer and Wholesaler of Home Lift. Our product range also comprises of Standard Passenger Elevators, Single Phase Home Elevators and Hydraulic Lifts. 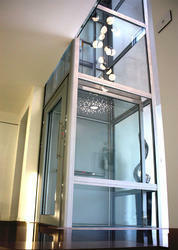 The core feature of Home Lift is that it can be manufactured according to customer's space availability. Moreover, the product needs no modification or alteration of the existing building interiors. No space is wasted either and it does not involve any costly running expenses or maintenance. Thanks to a hydraulic system, passengers get treated to an extremely seamless ride. The product can be exclusively decorated to suit the interiors. 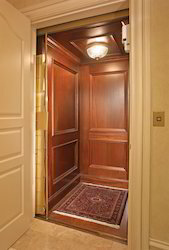 In our extensive range of products, we are offering our clients a wide assortment of Home Elevator. 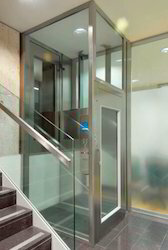 In tune with the industry set standards, offered elevators are manufactured using superior quality components and concurrent technology by our deft professionals. The provided elevators are also tested by our quality experts on different quality measures to ensure its high load bearing capacity. In addition, these elevators are available in different technical specifications to cater the variegated demands of our esteemed clients. Looking for Home Lift ?